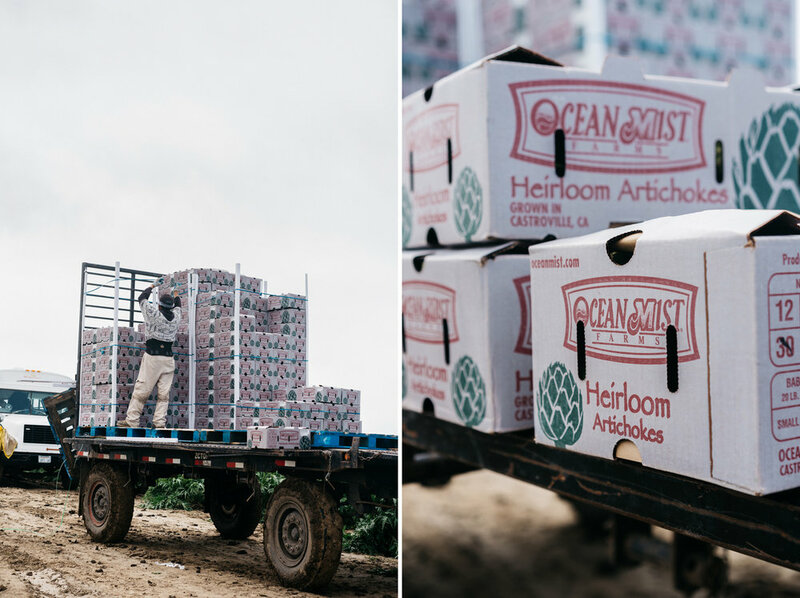 Last month I had the most incredible opportunity to visit Ocean Mist Farms on behalf of Safeway on one of their Safeway Blogger Tours. I love farm tours, restaurant visits, and anything that has to do with gaining a better understanding of where our food comes from and learning about the people who are so passionate about growing the food that nourishes are bodies. Ocean Mist Farms is a family owned business that started over 90 years ago that started off in a little shed at Del Monte Junction. Their business began to grow and expanded into other vegetables such as asparagus, Brussel sprouts, cauliflower, iceberg lettuce, and more. Throughout their incredible journey of growth, they have continued their commitment creating producing quality from soil to table. 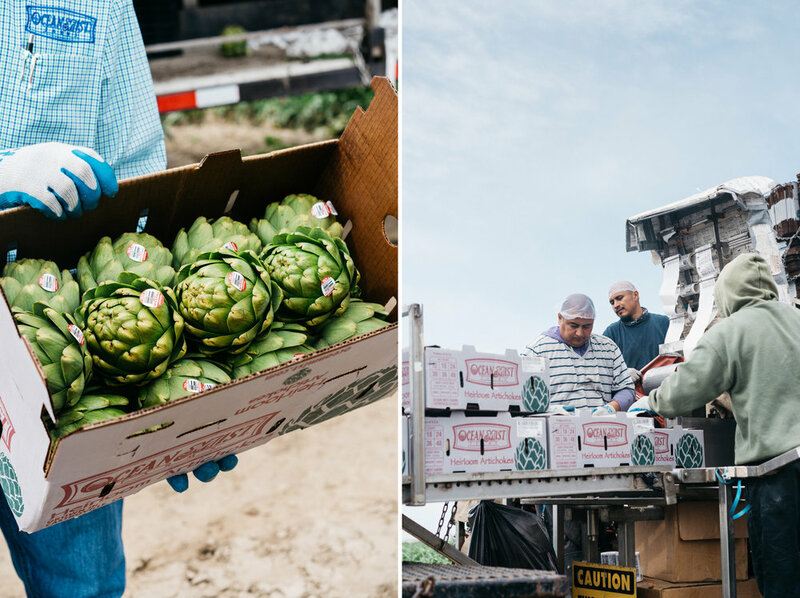 Today they are the largest grower of artichokes in the US. One of the things that I had learned during the farm tour was how artichokes were used as medicinal tonics in the Mediterranean and Eastern medicine cultures thousands of years ago. Artichoke herbal teas are rich in vitamin A, B, and C, magnesium, calcium, zinc, and dietary fiber. The teas were also used as a diuretic and helped to reduce cholesterol. During the tour they shared their growing practices with us and I even had the opportunity to harvest my own. After playing around in the fields we were treated to an incredible meal on the farm. A true farm to table experience hosted by Ocean Mist Farms and some of Safeway’s other partners Chandon, and Sun Pacific, the grower of one of our favorite snacks here at home, Cuties! I think one of the reasons why most people stray away from making artichokes at home is because of how intimidating it can be. But like most of my cooking, I like to keep things simple, fresh, and easy. I recently got an Instant Pot after hearing from so many people how life-changing it is. Although I can’t quite say that it's been "life-changing", it does make cooking artichokes a whole lot easier. Put the garlic cloves in the center of your artichoke. Doing this will help to release the aromatics from the inside/out. You can also just place the garlic cloves inside the instant pot with the water, but that’s not fun. Pour the water into your Instant Pot, and place the steamer basket on the bottom of the pot. Rub the lemon wedge all over the outside of the trimmed artichokes. (This helps add flavor and prevent browning/oxidizing.) 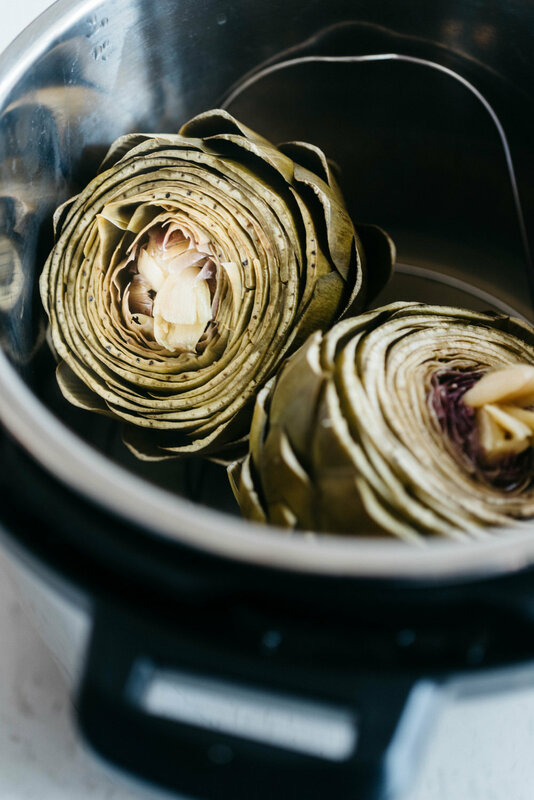 Place the artichokes in a single layer on top of the steamer basket, and toss the lemon wedge in the water below. Close lid securely and set the vent to “Sealing”. Press “Manual”, then press “Pressure” until the light on “High Pressure” lights up, then adjust the +/- buttons until time reads 10 minutes*. Cook. Then very carefully, turn the vent to “Venting” for quick release, and wait until all of the steam has released and the valve has dropped. Remove the lid. 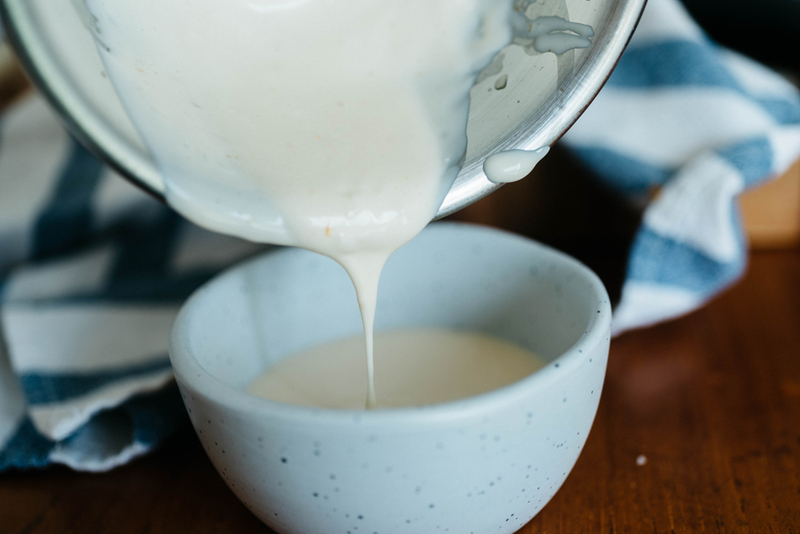 Carefully use a pair of tongs to remove the artichokes from the Instant Pot, and serve immediately with your dipping sauce of choice or the mandarin aioli. Enjoy! Combined all the ingredients, except for the mandarin zest, together in a food processor or blender until smooth. Stir in mandarin zest and let it cool in the fridge for at least 30 minutes before serving.